Arwen Fan art!. . 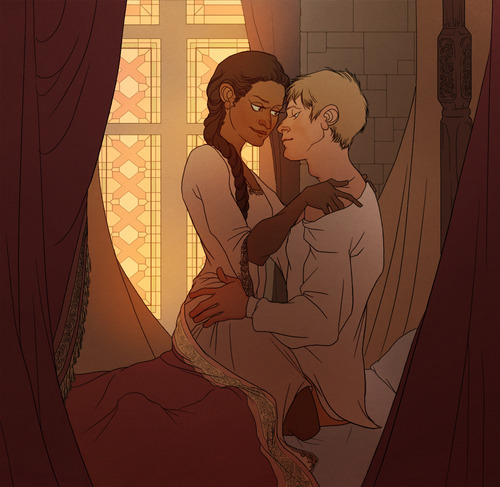 Wallpaper and background images in the Arthur und Gwen club tagged: bradley james angel coulby arthur gwen arwen. This Arthur und Gwen photo contains anime, comic, manga, cartoon, comic buch, karikatur, and comics. It's cute! I am happy with anything these days! Kim, I've actually caught up on Sleepy Hollow as Australia is fast-tracking it and I love it. I don't ship Abbie (I giggle because that is one of my sisters names. And you know Angel plays Laura in The Tunnel and that is my other sister's name. That also made me giggle) and Crane romantically though I do adore their banter and friendship so much. I actually like Crane with his wife and I want to see more of their back-story. I'm all about the Ichabod/Abbie thing. Katrina can stay dead. I haven't see any adds so far.. But I migth catch up with it this summer, aka when I have time. Oh and you too shipping different couple actually makes me want to see it. You should totally watch it Joppa! LOLs a lot of people are shipping Ichabod/Abbie but I just don't see it in that way. Though, I do love their banter a lot. LOLs Kim, you cheeky thing!